For Mr. Benny, evading pirates and smuggling tin were all in a day's work. 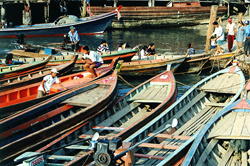 Boats at the watery border between Thailand and Burma. I had just returned to the rainy border town of Ranong, Thailand, after an absence of five months. It was April 9, 2003, the day U.S. tanks rolled into central Baghdad. Matthew had been squatting in the guesthouse lobby, translating BBC commentary for the other hotel workers — all of them illegal migrant workers from Burma. Deciphering the images from Iraq proved to be a difficult process, since even the BBC commentators didn’t seem to know what was going on. Had Baghdad fallen or not? Were the U.S. soldiers welcomed or reviled? Nobody knew for sure, but when a soldier on the TV flung an American flag over the head of the Saddam Hussein statue in Firdos Square, the Burmese workers had let out a cheer, as if Rangoon’s junta would be next. When the BBC cut to a commercial, Matthew finally looked over at me. “How did you know Benny?” he asked. Matthew’s eyes were dark, fringed by faint yellow; he wore a crisp Oxford shirt, and his black hair was just beginning to show gray. A devout Baptist like many ethnic Kayin, he was painfully earnest in his beliefs — a quality that would eventually get him fired from the guesthouse. Phiman was a Thai man who owned the dusty little TV repair shop where Mr. Benny slept. Since I didn’t speak enough Thai for Phiman to understand me, this meant I had to get translation help from Ezio, a barrel-chested Italian who lived with his Thai wife on the other side of Ranong. I’d sold my motorcycle when I’d last left Thailand, so I headed off to Ezio’s place on foot, skirting the hot, murky puddles that dotted the streets after heavy rains. Of all the places in the world where I’d lived for more than a couple of months, Ranong was by far the most obscure. 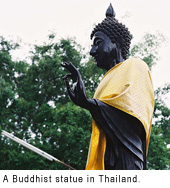 A frumpy border town of 30,000 people in the rainiest part of Thailand’s isthmus, it held little appeal for tourists — apart from its proximity to the southern tip of Burma, where backpackers enamored with the country’s meditation retreats and full-moon parties could get a cheap re-entry visa in a couple of hours. Besides fishing and tin mining, timber poaching and amphetamine smuggling seemed to be Ranong’s principal industries, and scores of refugees from Burma’s repressive dictatorship lived in squalid huts at the edges of town. Heavy rains resulted in power blackouts that could last for days, and the sour-fresh scent of rainforest competed with the fishy smell of the port. Though just four hours by motorcycle from the tourist resort of Phuket — and 10 hours by bus from the modern hum of Bangkok — Ranong felt years away from the rest of Thailand. I’d first arrived in Ranong two years earlier, while writing an article about the Moken sea gypsies who lived in the islands on the Burmese side of the sea-border. I’d been trying to build my career as an adventure-travel writer, and a Major American Luxury-Travel Magazine had underwritten my journey to investigate recent tourism ventures into Moken territory. I didn’t have a permanent address at the time, so I’d rented a studio room at the Lotus Guesthouse to write the sea gypsy article. When it was finished I decided to stay in the sleepy town to work on my first book, a philosophical how-to primer about long-term travel. Writing my book required long stretches of isolation, and I didn’t socialize much during my stint in Ranong. I tried to get out of my room to explore the town from time to time, but even six months into my tenure, Thai kids who lived just a few blocks away from my guesthouse would shout “farang!” at me as I walked past, as if I was just another random backpacker in town for a visa run. The word, which means “foreigner,” was a reminder of how little I really knew about the daily workings of Ranong, or of Thailand in general. Besides Ezio and Matthew, the only person I saw regularly when I lived in Ranong was Mr. Benny — a thin, sexagenarian Burmese émigré who worked at a humid storefront barbershop in the center of town. His haircuts cost 40 baht (about $0.90 at the time), and afterwards he’d invite me to a dim café next door and spend most of his fee on coffee thickened with condensed milk. As we sipped from dented aluminum cups, he would tell me stories about his younger years, when he would make ends meet for his family by smuggling tin to Malaysia, or diving for pearls off the coast of Burma. Sometimes he’d invite me to join him for Sunday services at the local Catholic chapel; other times he’d ask me to meet him at his cramped bunkroom in the TV repair shop to practice English vocabulary. When he learned that I hailed from the prairies of North America, he told me that his favorite English-language book was an old cowboy novel called The Big Sky. I’d found a used copy of the novel when I was back in the U.S. on my book tour; one reason I’d returned to Ranong was so that I could present The Big Sky to Mr. Benny. The other reason I’d returned to Ranong was to find some isolation so I could finish a magazine article that was weeks overdue. The adventure stories I’d written two years earlier for the Major American Luxury-Travel Magazine had attracted the attention of a Major American Adventure-Travel Magazine, and I’d been discussing possible assignments with an editor for months. Unfortunately, no story I proposed — exploring fishing villages along the upper Cambodian Mekong, mountaineering in Turkish Kurdistan, visiting the isolated tribesmen of the Andaman Islands — seemed quite right for him. We’d finally settled on a how-to feature about “classic adventures” in Asia. 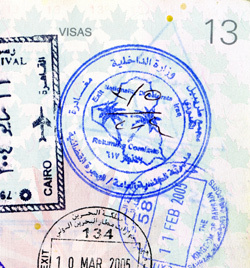 I’d spent much of the previous three years adventuring through the distant corners of the Asian continent, but this experience had put me at a weird disadvantage in reporting the story. “You’re giving us too much geography,” my editor would tell me every time I submitted a new list of destination summaries. Readers of Major American Adventure-Travel Magazines, he told me, didn’t want to read about journeys that were obscure or complicated; they wanted exotic challenges wherein they might test — or, at least, imagine themselves testing — the extremes of human experience. For weeks, I had trouble understanding exactly what this meant, and my increasingly irritated editor returned my story drafts marked with comments like, “Is there a helicopter service that can get you there faster?” and, “Would you recommend some cutting-edge outerwear for this kind of trek?” and, “Can you think of any celebrities who’ve visited the region recently?” In time, I discerned that adventure itself was far less important to the magazine than creating a romanticized sense of adventure — preferably with recommendations on where to buy a cappuccino and a Swedish massage afterwards. The Major American Adventure-Travel Magazine, it seemed, wanted me to create a tantalizing recipe for the exotic and the unexpected, but only the kind of “unexpected” that could be planned in advance and completed in less than three weeks. It took me less than half an hour to walk the damp streets to Ezio’s house. Pong — his slim, shy Thai wife — answered the door. At 23, she was exactly half his age; he’d met her when she was still a student in a country village across the isthmus in Chumphon Province. Before Pong, Ezio had a previous Thai wife — an ex-bargirl who had borne him two daughters and tried to kill him twice before their marriage ended. She had once stabbed him in the back with a kitchen knife; another time she’d dumped poison in his soup. He had recovered unshaken both times, but their marriage fell apart after a few years, and he rarely saw his daughters anymore. Newly remarried, Ezio was teaching Pong how to help him with his Web site-design business, and they were successful enough to employ two Burmese girls to cook and clean for them. I didn’t argue with him. Twenty-five years ago, Ezio had left Rome for a winter holiday in North Africa, and he’d never returned. He’d taught himself Arabic in Algeria, learned to live in the desert, bought a few camels, and made a living as a tour guide. Intrigued by wars, he eventually wandered on to Uganda, and then Lebanon, and then Sri Lanka, picking up languages as he needed them. He eventually landed in Southeast Asia, where he fell in love with Thai women — all of them, from the way he described it — and he’d been based in Thailand for over 10 years now. What Ezio had done with his life was unusual, but not unique. Every out-of-the-way province in Southeast Asia, it seemed, had a few guys like him — aging expats who’d lived remarkable lives, and enjoyed their anonymity with no plans of going home. Whenever I talked to Ezio I was reminded of how the storied travelers of history invariably discovered they were not alone in their wanderings — how William of Rubrouck arrived in Karakorum to find Ukrainian carpenters, Greek doctors, and Parisian goldsmiths; how Marco Polo encountered Lombards, Germans, and Frenchmen in the streets of Cambaluc. These people’s stories were never told because they never went home. I took my espresso and moved into the living room. Ezio brought out a package of cigars he’d bought during his latest run to Burma. We lit them, and Ezio caught me up on the local gossip — how local gangsters were turning the island of Koh Samui into the Sicily of Thailand; how an influx of Burmese girls had turned Ranong into one of the cheapest places in the country to buy a prostitute. When Ezio ran out of news, I asked him about Mr. Benny. Repairing televisions and cutting hair were just two of Mr. Benny’s many callings in life. Born to a Portuguese-Kayin mother, who met his Chinese-Thai father in southern Burma during the Japanese occupation of Ranong in World War II, young Benny was trained in English by Irish priests at the local mission school. When his family’s finances got tight, his unique language skills led to his first job at age 14: fighting communists with a regrouped Chinese Kuomintang army in northeastern Burma. At a time when the average daily income for a Burmese soldier was 15 kyat, Benny made 150 kyat a day carrying ammunition belts and translating intelligence information for American CIA advisors. Marriage to a local girl took Mr. Benny out of the sea and into a barbershop, but the arrival of children left him in need of a better income, so he took up an offer from a group of wealthy Taiwanese men who needed a guide and translator for a rhino-poaching excursion in the Burmese jungle. Dodging the Burmese army along the Thai borderlands, the expedition party dragged on for six months, surviving on deer and monkey meat before they managed to bag a rhino; Benny came home with his hair “long, like an Indian,” and his young children didn’t recognize him. After the Burmese military coup in 1961, English was officially regarded as a “slave language,” and Mr. Benny was forced to toss out his books, including his favorite, A.B. Guthrie’s The Big Sky. The local economy nose-dived, and Benny increasingly found it necessary to cross into Thailand and do construction work to keep his family fed. For a while he managed to make as much as 800 baht a day smuggling tin across the sea border to Malaysia, until one winter day a group of pirates posing as policemen seized his boat and tossed him overboard. Mr. Benny swam the three miles back to shore and returned to cutting hair. On the side, he taught himself how to fix radios, and, later, TVs. It was a skill he returned to in his old age. Ezio seemed skeptical that a man who was too sick to cut hair could work on televisions. “You can’t do that kind of thing with shaky hands,” he said. Ezio chuckled and stubbed out his cigar. “Let’s go and see what Phiman knows,” he said. As I rode into central Ranong on the back of Ezio’s motorcycle, it occurred to me that I didn’t even know the exact nature of Mr. Benny’s sickness. His shaky hands implied Parkinson’s disease, but he also had increasing trouble keeping his food down. On a couple occasions I suggested that he visit a doctor, but he always waved me off. “This is just what happens to old men,” he said. Mr. Benny didn’t like talking about his health, and it was only at my urging that he elaborated on his memories of Malay pirates and Kuomintang mercenaries. To him, smuggling tin and tracking rhinos were merely jobs — better paid, but not entirely dissimilar to cutting hair or pouring concrete. Usually, he would steer our conversation to the small, charmed moments he remembered from his life, like the first time he learned what garbage was. (“Before, everything was reused or fed to the animals.”) One of his favorite memories was the time a fisherman brought him a bottle containing an English-language letter from a 7-year-old Dutch boy named Donald, who became Mr. Benny’s pen-pal for the next five years. He also loved to recall his friend’s failed attempt to make an airplane using wood planks and a 120-horsepower motorcycle engine. He asked me countless questions about what it was like to live on the American plains; in his mind, I think, my home was inseparable from the pages of The Big Sky. “But are you sure he was going to die?” I asked. I went back a week later, and the week after that, but Phiman had no news about Mr. Benny. 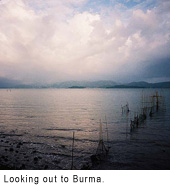 Things changed as Ranong slipped further into the rainy season. 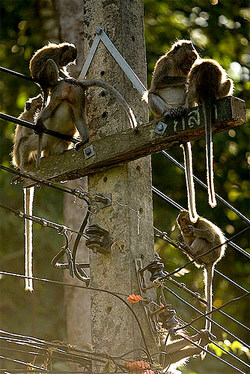 Ezio and Pong decided the power blackouts were bad for their Internet business, so they moved upcountry to Chiang Rai. At the guesthouse, Matthew made the repeated mistake of assuming Western backpackers were as excited about the fall of Baghdad as he was. It didn’t help that he was an unrepentant Baptist, given to salting his conversations with cheery Gospel references. More than once this led to bizarre scenes in the lobby, where sunburned Germans and Canadians and Californians angrily lectured Matthew about the pacifistic merits of Buddhism while the Kayin desk clerk tremblingly tried to explain how Burmese Buddhists had murdered his brothers. It was as if the backpackers didn’t know what to do with this meek little brown man who, with his professed love of Jesus and affinity for George Bush, didn’t follow the accepted narrative of how Southeast Asians were supposed to act. Less than a month after he translated the defeat of Saddam Hussein for his coworkers, Matthew was fired and replaced with another Burmese migrant — a serious young Buddhist kid who fetched keys, kept his mouth shut, and garnered no complaints. Eventually I finished the last rewrite of my article for the Major American Adventure-Travel Magazine. I e-mailed it to my editor, requesting that it run without my byline. After checking out of the Lotus Guesthouse, I slipped a self-addressed envelope into my copy of The Big Sky and left it with Phiman in the hope that Mr. Benny might one day come back. Rolf Potts is the author of Vagabonding: An Uncommon Guide to the Art of Long-Term World Travel (Random House, 2003). His work has appeared in publications such as National Geographic Traveler, WorldHum, Conde Nast Traveler, Outside, Islands, Salon, and Slate. Each summer he can be found in France, where he is the summer writer-in-residence at the Paris American Academy. He can be reached at rolf@rolfpotts.com.